EURO-k conferences are the major EURO events. They are international forums for scientific communication and cooperation among Operational Researchers, not only from European countries, who are active in all the diverse areas of OR, and to serve the free exchange of new ideas and promising research results. they are broadly oriented and have recently attracted more than 2,000 participants. they take place yearly, with the possible exception of the years when there is an IFORS triennial conference. Information about past conferences is available. they are hosted by EURO member societies. They are usually held in a university or similar type of institution. Plenary, semi-plenary, tutorial and panel sessions given by prestigious invited speakers. Regular streams, defined as blocks of sessions within a thematic OR area. Sessions can be invited or contributed. Contributed paper presentations are welcomed and processed by the PC. Making an Impact stream. This is a series of participative activities aimed at helping practitioners to become more effective. OR Education stream focusing on best practices for teaching OR. Awards of EURO prizes. The EURO Distinguished Service Medal Award and the EURO Gold Medal, accompanied by a lecture of the Gold Medal laureate, are presented at the Opening Session. The presentations of the finalists of the EURO Excellence in Practice Award and the EURO Doctoral Dissertation Award are scheduled as parallel sessions. 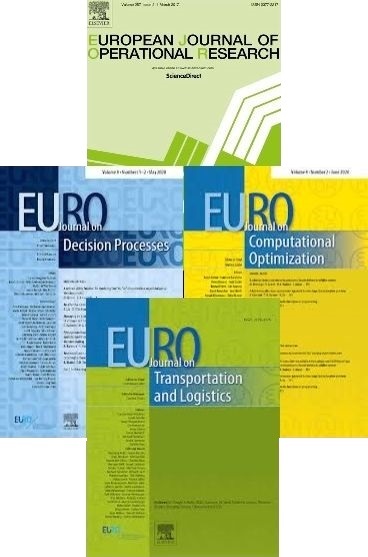 These prizes are awarded to the winners during the Closing Session along with the winners of the EURO Award for the Best EJOR Papers. Possibility of visits to companies where OR is used in daily actvities. National OR societies that are full members of EURO are regularly invited to submit proposals to host future EURO-k Conferences. Proposals for hosting EURO-k Conferences must be approved by the EURO Council, typically 3 years before the proposed date. If you are interested in organising a EURO-k Conference read the guidelines section and contact the EURO Vice President 1 ([email protected]) for further details.